Cookbooks - Are You Using Yours? I love cookbooks and used to collect them by the dozen. Something has happened to me recently, though, and I seem less drawn to them, at least when it comes to looking for a new and creative recipe. About a year ago, I realized that my collection of cookbooks had outgrown their storage spot in our tiny house, so I decided to cull them. Out went the fancy cookbooks that I had barely opened and the esoteric ones I had picked up on impulse, usually while on vacation. In no time, I amassed a huge pile to donate to our local library branch, where I knew, as a former volunteer, they would sell like hot cakes at the next book sale. On the other hand, I have to admit that there is almost nothing I love more than curling up with a new cookbook, paging through it and imagining what I will cook from it. My latest favorite is “Prune”, the long awaited cookbook by Gabrielle Hamilton, owner of Prune, a tiny restaurant in New York that I’d love to visit. ( Gabrielle is also the author of her compelling memoir, “Blood, Bones and Butter”.) “Prune” is a unique and cleverly assembled cookbook that I’m sure has a firm spot in my collection. In fact, I will be doing a post from it next Friday. My older collection of cookbooks are dog-eared and stained, and tend to be at least ten years old. Those were the days when I discovered Ina Garten and Melissa Clark, among others, and my cooking turned into a passion that ended up in my beginning a food blog over four years ago. These days, though, I seem much more likely to draw inspiration from the half a dozen food magazines I peruse every month or the Wednesday Food Section from The New York Times. And if I want a quick, basic recipe as a jumping off point for a post, I usually hit either google or the food network recipe index online. But I do so love my cookbooks, once again threatening to fall from their crowded shelf above my desk here in the kitchen. 27 Responses to Cookbooks – Are You Using Yours? I adore my cookbooks! And I do still cook from many of them—but I must say that I do find it easier at times to google and compare 5 or 6 different recipes at a glance before I decide on one. I have tons of printed recipes as well, with notes on what worked/what didn’t. I can never pick a favorite, I have three on the couch right now 🙂 Flavor Flours, Le Tartine Techniques, and Aglea’s Vegetarian Mediterranean–loving all three. In terms of my go to, always Joy of Cooking for anything basic. And blogs, well, I subscribe to many! If something looks great, I always pin it for later 🙂 My pinterest page has a huge collection of things I have made and want to make. It’s a work in progress it is. I like learning about you and your cookbooks, Wendy – I should have added that my recipe box is heavily used as well – plus, I have my Mom’s. Oh I love this topic! Having just moved I should have culled a lot more cook books than I did. In the end most of them came with me, along with the comment from my husband “why, you hardly use them”. While that’s a little harsh it is true I rarely look at some of my cook books but I still love them. I am more likely nowadays to use the Internet while searching for a recipe but that’s more of an impatient speed thing, I still love cook books. Ottolenghi’s Plenty More is my next want! Thanks for keeping the discussion going, Jayne – I’m really curious to hear what folks have to say on this topic. WHen we moved from Oklahoma to Kansas 2 and a half years ago, I donated a bunch (big bunch) of cookbooks to the library. I am guilty of owning and amassing way too many cookbooks and I continue to add to my collection, I look through them use some of them but the majority sit on the shelf like trophies. I cannot bring myself to get rid of them. If I need a recipe it’s so much quicker on the computer but I do love my cookbooks the photo are so nice. Yes, exactly, like trophies or memory books on the shelf. Ha — you know you are a Cookbook Junkie (the name of my group of 15,300 members and growing) when you try to click on that photo and read the titles of all the books. I love my cookbooks – I have too many now – I’ll be culling them. Hi Liz- you read my mind. This is a topic that I have been thinking about too. I have a vast collection of cookbooks (some of them signed) that I am attached to. Yet I rarely use them any more. If I’m researching a recipe, I usually use google search. I am a fan of recipe blogs that are reliable and have personality– I pin quite a bit from them, and then use my Pinterest boards. I feel like I have completely migrated to digital, and wonder if cookbooks are becoming obsolete. I hope not, but I am one of those people who read “real” newspapers every morning and visit our local library every week or so. Like all the other readers I have way too many cookbooks. I also have drawers and folders full of recipes. Honestly, I should cull about two thirds of them. Looking for recipes on blogs has become one my favorite past times. I like reading cookbooks that come with stories like “My Berlin Kitchen “. I also have several cookbooks where I use one or two recipes. I enjoy books from Alice Waters. It is a hard task.I hang onto family recipes above all, including cookbooks I cooked from, religiously, some ten or so years ago. Oh, Liz – you know how I love my cookbooks!! I turn to my Ina Garten books for everything, and use the online index of her books on her website to actually find stuff. My other go-to is “Fast, Fresh & Green” which I love for roasting vegetables. I use my Cook’s Illlustrated gluten-free book regularly for chocolate chip cookies. But, like you, I still need to weed out the books I don’t use. I really learned from Ina – and she reinforced methods of cooking that I was already implementing. It’s so hard to depart with my cookbooks! They carry so many memories of past dinner parties, kid’s birthdays, and holiday events. They make for a great companion on a sunny Sunday morning with my coffee. What I love most about them, is they tell my story, and hopefully someday when I pass them on to my children-they too will enjoy them as much as I do. I understand, Mary, I am very, very attached to some of mine, especially when I have written on certain recipes, “Made for Mama and Larry – they loved it”. I have hundreds and hundreds of cookbooks and do love all of them… I find inspiration in them and have numerous recipes from the last few decades that I go back to again and again. However, more recently I am finding inspiration from either chefs whose restaurants I visit in my travels, or Pinterest, would you believe. Anyhoo, happy cooking. 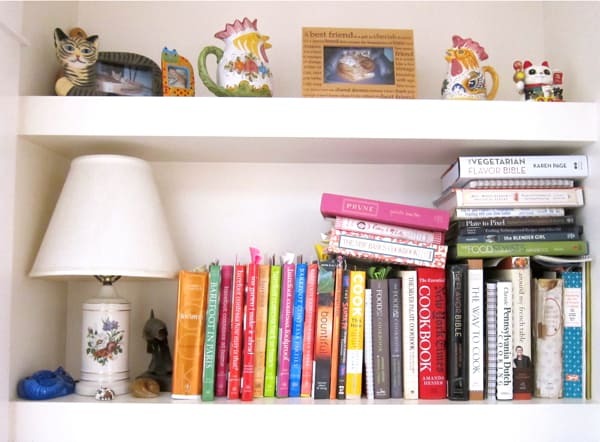 Thanks for your visit and comment – I can’t imagine having hundreds of cookbooks – where do you keep them? Yes, Pinterest can be inspiring and helps me think about my food photography. The last cookbook I read was Prune. Can’t wait to see your post! I love cookbook, and half of my living room is full of them. Thank goodness for buiilt-in bookshelves. I also find them pretty and decorative. What I do, is occasionally pull out 4-5 cookbooks, mark recipes in them that are seasonally appropriate, or look at already marked recipes, and put these cookbooks in the kitchen. That way it reminds me to actually cook the recipes. Otherwise, they sit there and look pretty in my living room, even though I always read them once when I first get them! I need more discipline – like your method, Mimi. I have such limited space that they have to be REALLY special to keep. Otherwise I gift them to my readers. I love looking through new ones each month for my review series, and a few are just so gorgeous I have kept them. The ones I keep mainly are for reference for speciality things: Vietnamese, Gluten-free Baking, raw recipes, etc. Great post! I can only imagine how many cookbooks you could end up saving, with your weekly cookbook review. I hqve bought many cookbooks to read as novels, like Blue Corn and Chocolate by Elizabeth Rozin, and others that I have planted by, like the ones from Renees’s Garden. I keep the BHG cookbook as my basic, and I’ve used the South Beach Diet, when I was trying to be good, and a couple of Giada’s, mostly Everyday Italian. I keep recipes that I find in magazines, cooking or otherwise, in boxes, and my New Year’s Resolution for 2013 was to try at least one a week from that box. Now, I watch and dvr recipes from The Chew, Giada at Home, and various and sundry others. I see cookbooks that I would really like to buy, and have made myself “step away!” Cooking is just too much fun!